The job duty of a Child Care Provider is to supervise children and monitor their developmental at a child care center or in their parent’s residence. 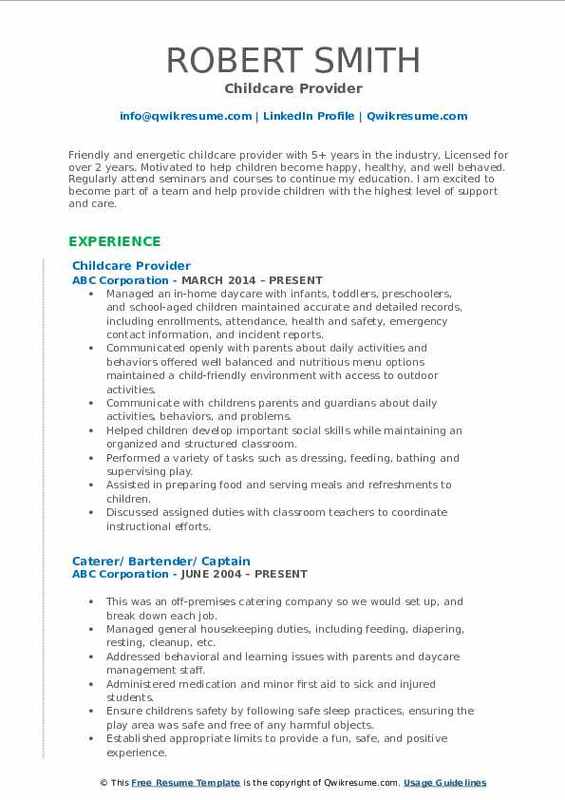 Typical work activities seen on a Child Care Provider Resume include – supervising children at all times, organizing variety of activities for children, maintaining and organizing the play area, offering guidance, changing diapers and helping in feeding, serving meals and snacks on time, providing opportunities for the child to learn, play and take rest; teaching basic or foundations of math and literacy; and communicating to parents about their wards progress. Those interested in this field must demonstrate the following skills and abilities – ability to interact with children, knowledge of early childhood development, supervisory skills, basic teaching skills, reliability and integrity; and good observation skills. A degree in the field of early childhood development or education is common among job applicants. 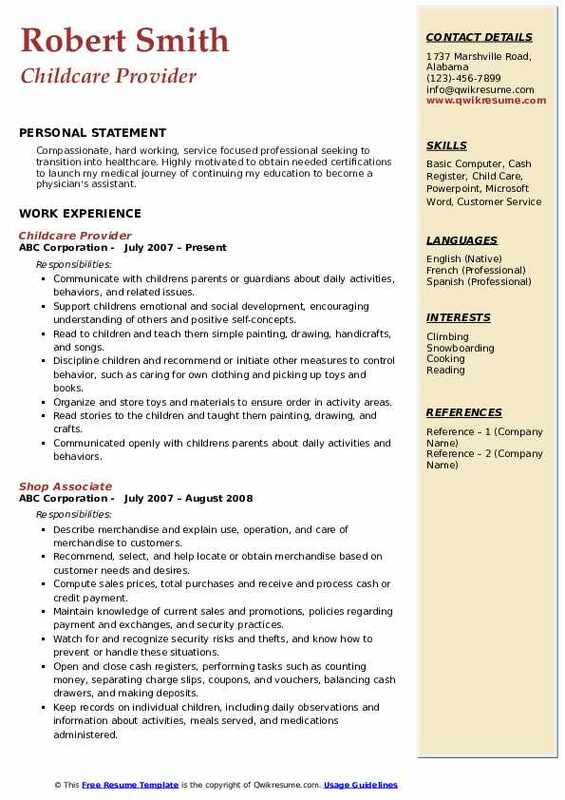 Headline : To transfer years of customer service and organizational experience into a challenging entry-level position at an established organization, which seeks a hands-on team player with extensive capabilities and my education and work experience will have valuable application as well as the ability for career advancement. Childcare workers often help preschool-age children prepare for kindergarten, Young children learn from playing, solving problems, questioning, and experimenting. Improve children's social skills by having them work together to build something in a sandbox or teach math by having children count when building with blocks. Involve the children in creative activities, such as art, dance, and music. Childcare workers also often watch school-age children before and after school. Helped children with homework and take them to afterschool activities, such as sports practices and club meetings. Managed general housekeeping duties, including feeding, diapering, resting, cleanup, etc. Summary : Excellent organizational and communication skills working in fast-paced environments demanding technical and interpersonal skills Self-motivated professional, demonstrated leadership skills and experience necessary to interface effectively with all levels of management. 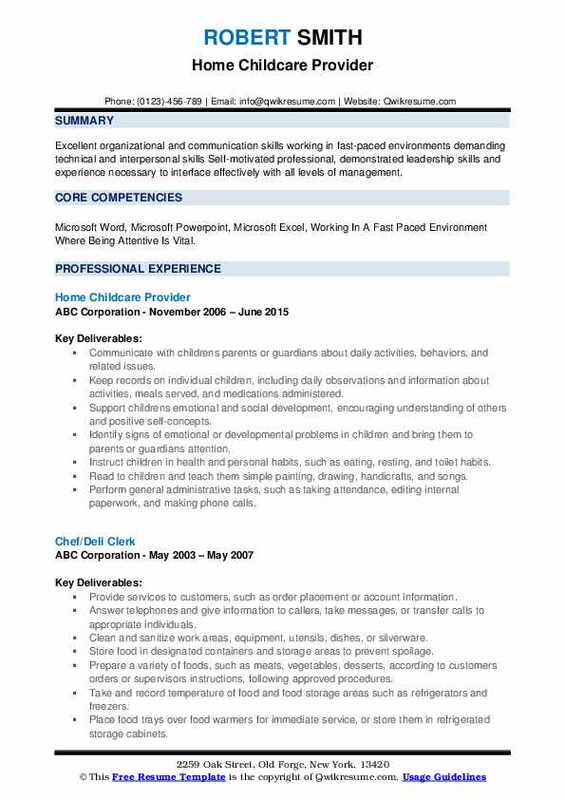 Skills : Microsoft Word, Microsoft Powerpoint, Microsoft Excel, Working In A Fast Paced Environment Where Being Attentive Is Vital. Identify signs of emotional or developmental problems in children and bring them to parents or guardians attention. Objective : Energetic, driven worker eager to deliver and display strong organization, communication, and relationship building skills. Articulate and friendly with a professional demeanor. Maintained daily records of children's individual activities, behaviors, meals, and naps. 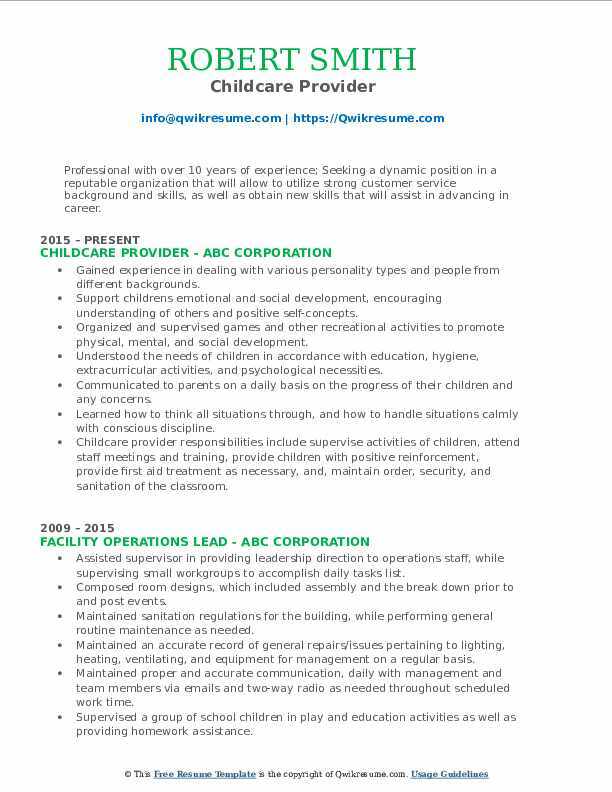 Summary : Friendly and energetic childcare provider with 5+ years in the industry, Licensed for over 2 years. Motivated to help children become happy, healthy, and well behaved. Regularly attend seminars and courses to continue my education. I am excited to become part of a team and help provide children with the highest level of support and care. 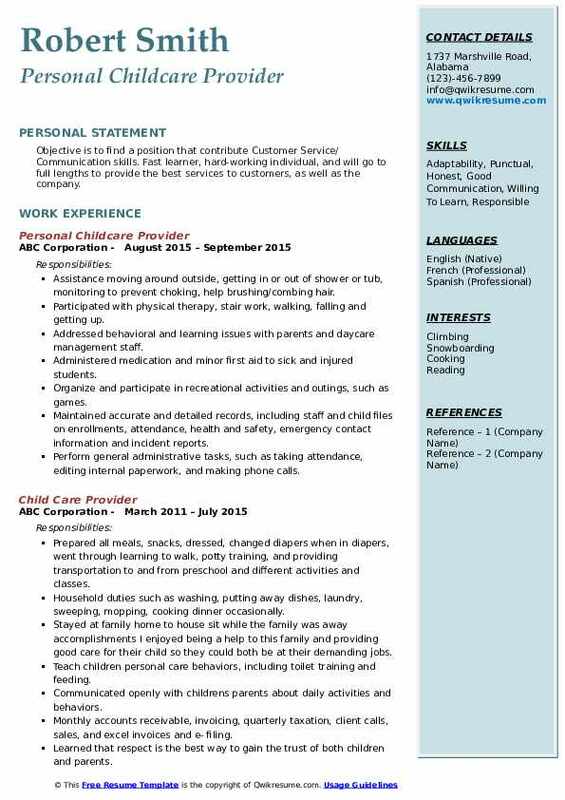 Managed an in-home daycare with infants, toddlers, preschoolers, and school-aged children maintained accurate and detailed records, including enrollments, attendance, health and safety, emergency contact information, and incident reports. Communicated openly with parents about daily activities and behaviors offered well balanced and nutritious menu options maintained a child-friendly environment with access to outdoor activities. Communicate with children's parents and guardians about daily activities, behaviors, and problems. Helped children develop important social skills while maintaining an organized and structured classroom. Performed a variety of tasks such as dressing, feeding, bathing and supervising play. Assisted in preparing food and serving meals and refreshments to children. 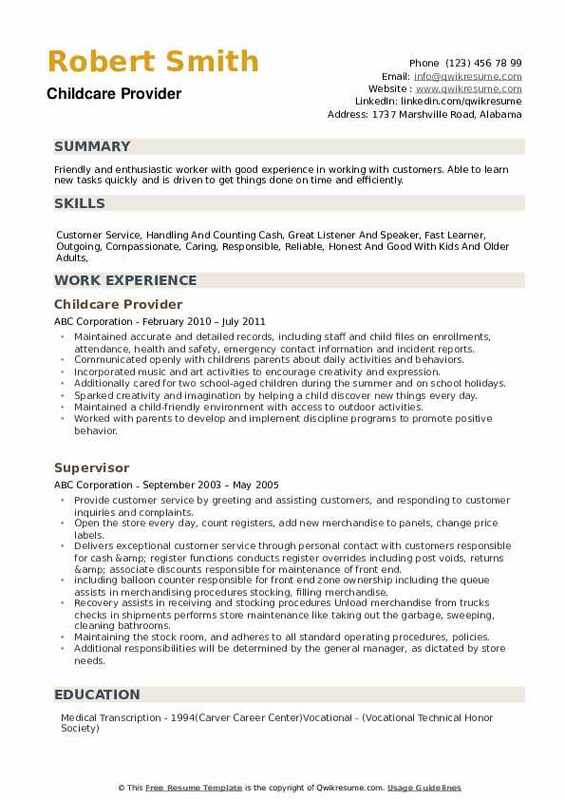 Objective : Objective is to find a position that contribute Customer Service/ Communication skills. Fast learner, hard-working individual, and will go to full lengths to provide the best services to customers, as well as the company. Assistance moving around outside, getting in or out of shower or tub, monitoring to prevent choking, help brushing/combing hair. Participated with physical therapy, stair work, walking, falling and getting up. Addressed behavioral and learning issues with parents and daycare management staff. Organize and participate in recreational activities and outings, such as games. 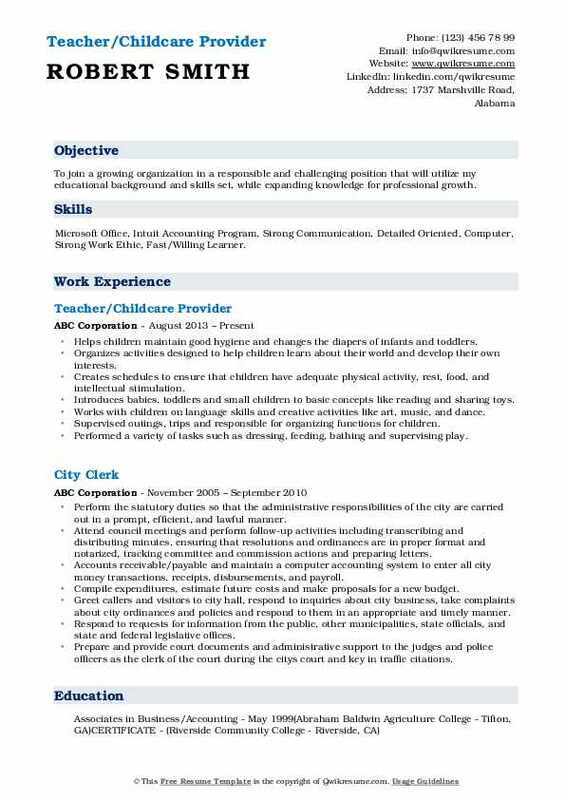 Summary : To join a growing organization in a responsible and challenging position that will utilize my educational background and skills set, while expanding knowledge for professional growth. 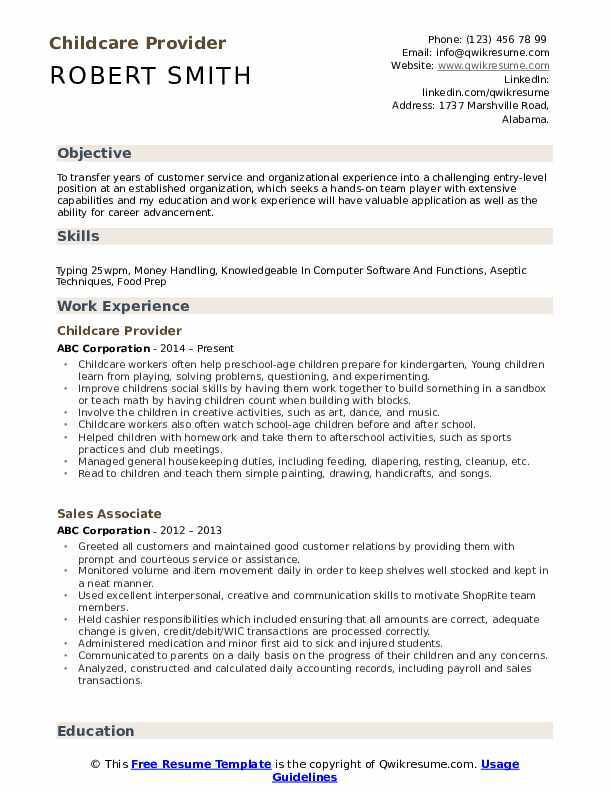 Skills : Microsoft Office, Intuit Accounting Program, Strong Communication, Detailed Oriented, Computer, Strong Work Ethic, Fast/Willing Learner. Helps children maintain good hygiene and changes the diapers of infants and toddlers. Organizes activities designed to help children learn about their world and develop their own interests. Creates schedules to ensure that children have adequate physical activity, rest, food, and intellectual stimulation. Introduces babies, toddlers and small children to basic concepts like reading and sharing toys. Works with children on language skills and creative activities like art, music, and dance. Supervised outings, trips and responsible for organizing functions for children. Summary : Professional with over 10 years of experience; Seeking a dynamic position in a reputable organization that will allow to utilize strong customer service background and skills, as well as obtain new skills that will assist in advancing in career. Gained experience in dealing with various personality types and people from different backgrounds. Organized and supervised games and other recreational activities to promote physical, mental, and social development. Understood the needs of children in accordance with education, hygiene, extracurricular activities, and psychological necessities. Communicated to parents on a daily basis on the progress of their children and any concerns. Learned how to think all situations through, and how to handle situations calmly with conscious discipline. 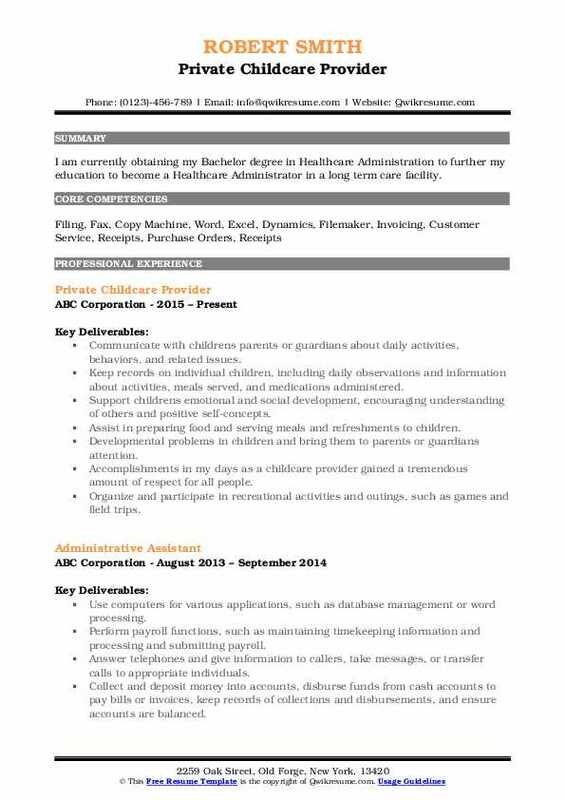 Childcare provider responsibilities include supervise activities of children, attend staff meetings and training, provide children with positive reinforcement, provide first aid treatment as necessary, and, maintain order, security, and sanitation of the classroom. Headline : I am currently obtaining my Bachelor degree in Healthcare Administration to further my education to become a Healthcare Administrator in a long term care facility. Developmental problems in children and bring them to parents or guardians attention. Accomplishments in my days as a childcare provider gained a tremendous amount of respect for all people. Summary : Compassionate, hard working, service focused professional seeking to transition into healthcare. Highly motivated to obtain needed certifications to launch my medical journey of continuing my education to become a physician's assistant. Summary : Friendly and enthusiastic worker with good experience in working with customers. Able to learn new tasks quickly and is driven to get things done on time and efficiently. 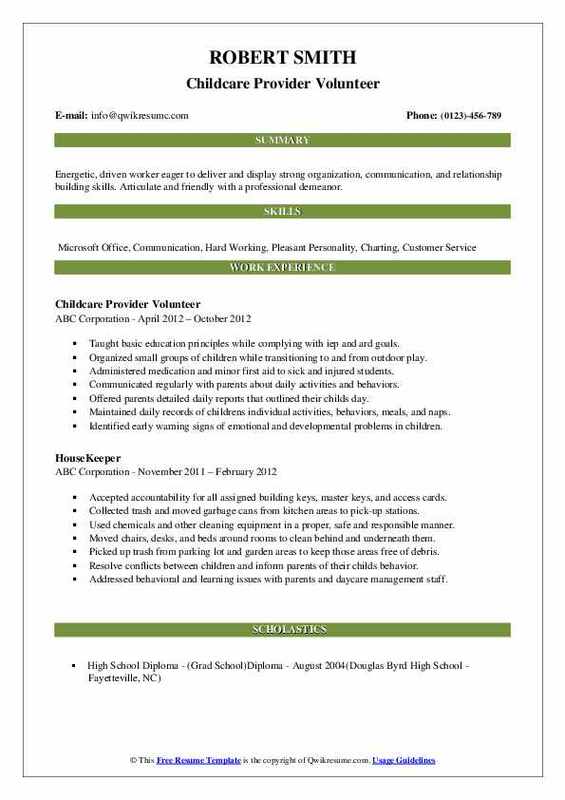 Additionally cared for two school-aged children during the summer and on school holidays. Sparked creativity and imagination by helping a child discover new things every day.